I have decided that I am not going to break posts up anymore. I have done it twice now, and while it worked really well the first time with Sauerbraten, this particular journey through preserving didn't turn out nearly as well. I had initially intended to use Honey in my Marmalade. Well I did, but I only replaced half of sugar with honey because I was ill prepared and did not have enough to use ALL honey in my recipe. On some level, considering the strength of the honey flavor in the Marmalade, I think I am glad that I did not have enough Orange Blossom Honey. Even with only 1 1/3 cups of Honey in the recipe, the Honey is REALLY strong. I first I thought it was a little strange that the honey should be so pronounced. My parents ALWAYS canned their fruits and preserves with honey, when I was growing up, and the honey flavor wasn't this pronounced. Then I remembered something.... Something deep in the back of my brain. They didn't use Orange Blossom Honey or Clover Honey when they were canning and cooking; they used Vetch Honey. 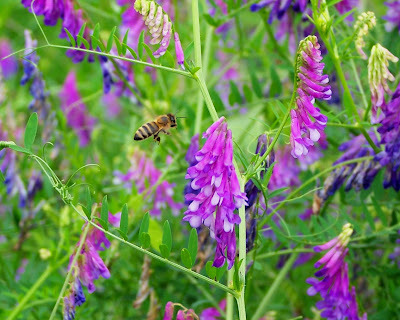 Vetch honey is extremely light and pale with little to no flavor other than "sweet". It's perfect for canning purposes when you want the true flavor of the fruit to come through. (Mom and Dad knew best) Alas, it's almost impossible to find now days. Which is a shame. Vetch isn't being planted as a cover crop anymore, at least not here in the Pacific NW, so if you want it, you have to order it from a "Specialty Honey Supplier". I hate ordering food products over the internet. Besides, I am so use to using what's available in the store, that I didn't even think about it. Don't get me wrong; Orange Blossom Honey is delicious, but I don't think it's a good Honey for canning. Lesson Learned. I suggest using the lightest honey you can find for this recipe. Then it will be perfectly delicious! OK, now that the boiled mixture has sat overnight, it's time to remove the cheese cloth bundle. Place it in a strainer and press out as much juice and pectin as possible. Measure the liquid and zest you have..... I had 5 cups, which you need to return to a large pot. Now, if you are using Honey, I suggest a 2/3 cup per 1 cup of liquid ratio. If using sugar, the standard is 1 cup Sugar per 1 cup of liquid. Place the mixture over medium high heat and stir until everything is dissolved. Place a thermometer in the pot and boil until it reaches 220 degrees. Place your water bath kettle over high heat and bring to a boil. Boil your lids in a small amount of water in a sauce pan for 5 minutes, then remove from the flame and set aside. Once the mixture has reached 220 degrees, remove the pot from the flame and skim the foamy goo off the top. Remove the jars from the hot oven, carefully, and ladle the hot mixture into the jars, leaving 1/4 inch of room at the top. Hold each jar with a pot holder, and wipe the threads of the jars with a damp paper towel before placing lids on top and screwing down the rings. Carefully lower the jars into the boiling water, bring back to a boil if necessary. and enjoy on a scone or, my personal favorite, Portland French Bakery's "Seeded Harvest". A sultry russet sunset on toast! Yum! Gorgeous recipe. Thank you so much-- the best I've seen after reviewing dozens on-line and in the latest canning cookbooks. I will try your recipe tomorrow using only honey and a tweaking it a tiny bit to add in a little warming flavors of Elderberry, Cinnamon and Ginger. Thank you again! !